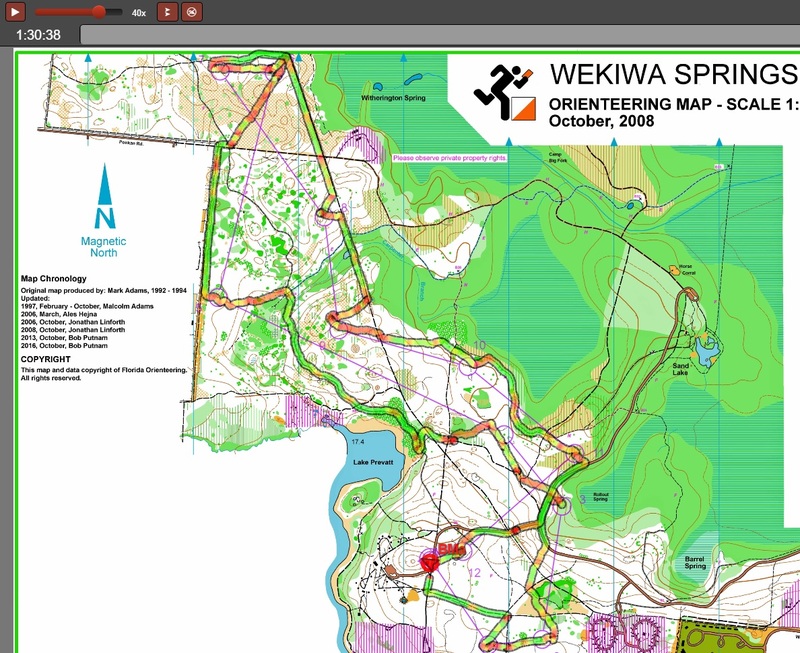 Livelox is the latest software creation from O-software developer Mats Troeng in Sweden (the author of the excellent QuickRoute tool for analyzing GPS tracks of Orienteering runs). 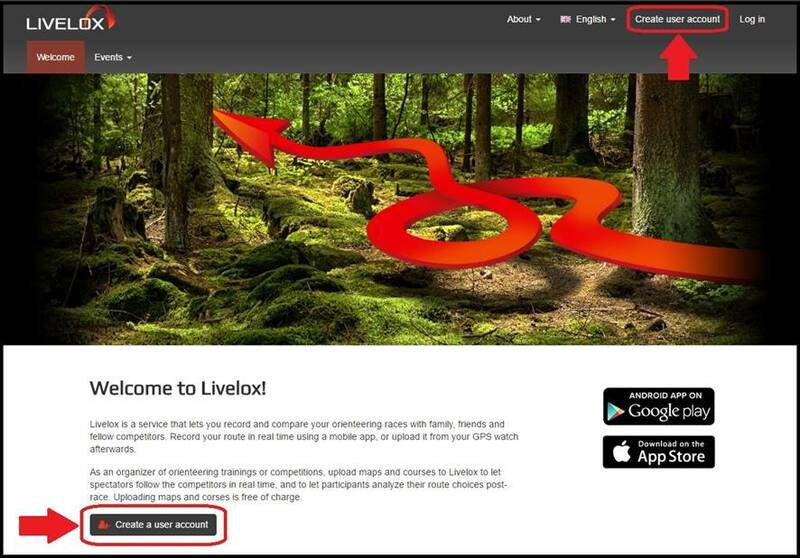 Livelox is a service that lets you record and compare your orienteering races with family, friends and fellow competitors. 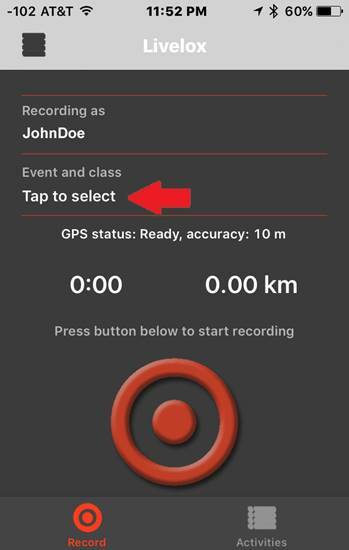 You can record your route in real time using a mobile app, or upload it from a dedicated GPS logger afterwards. 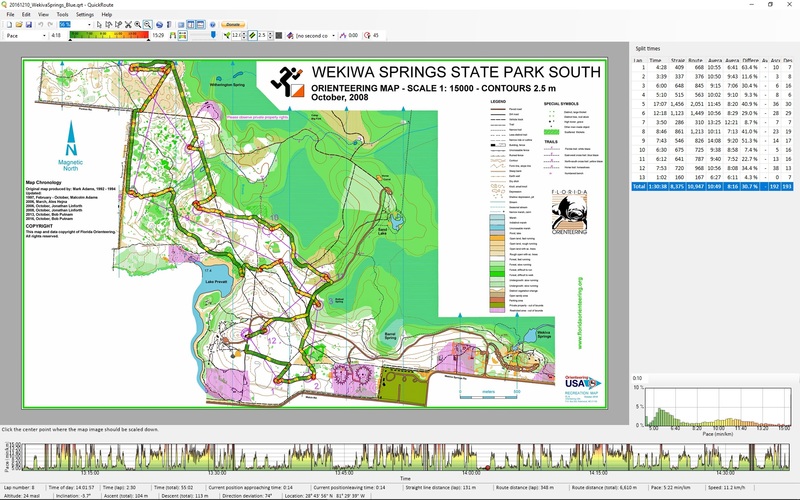 The Livelox web site has an interface much like that of RouteGadget, which automatically overlays your GPS track on your map and course, and allows you to play back your run, along with those of your friends and competitors, synchronized on the screen as if it had been a mass start. 1. An account on the Livelox web site (don’t worry, it’s free and easy to set up). 2. 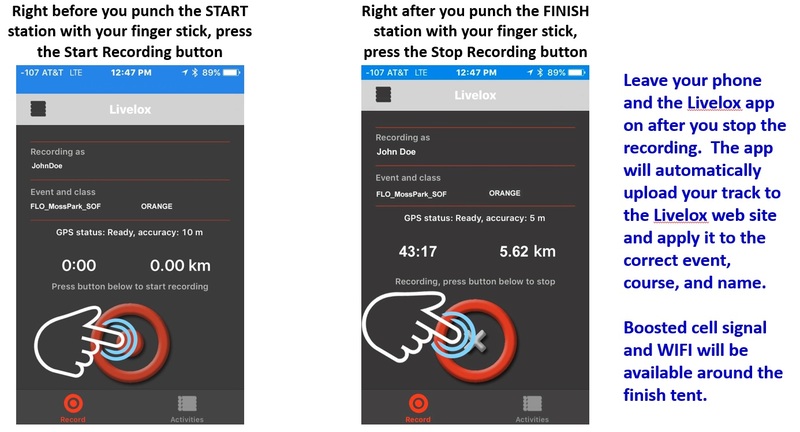 Some means of recording a GPS track of your run, the easiest being the Livelox mobile app, which will auto-sync your track with the correct map & course. On the resulting page, enter your first and last name and your email address, and pick a username and password for your account. Be sure to write down the username and password you choose – you’ll need these credentials every time you want to view, upload, or download a GPS track. Click the “Save” button to open your account. 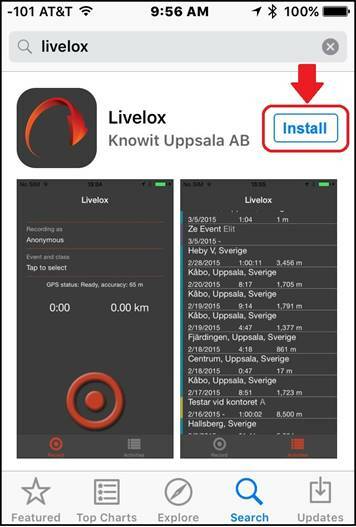 With your Livelox account created, you now need a method of recording GPS tracks. 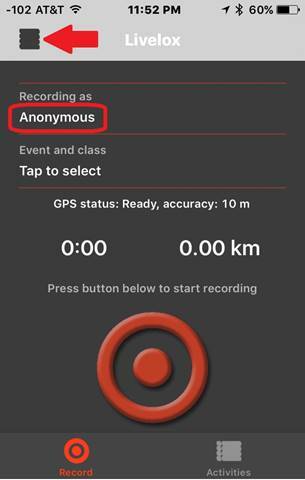 This can be done with any logging device that produces a GPS log file in GPX format, however the easiest tool to use is your Apple or Android smartphone running the Livelox mobile app. To install the app, open the App Store (iPhone) or Google Play store (Android) on your mobile device and search for “Livelox”. There should be only 1 app that answers to that name. Click “Install”. 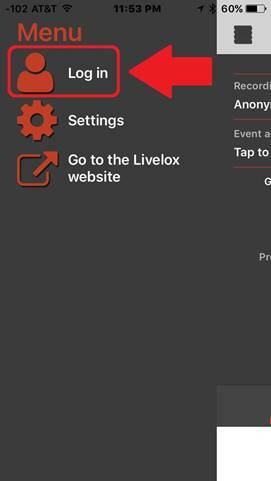 · Open the Livelox app on your mobile device. It will say “Recording as Anonymous” at the top. Click on the Settings icon at the top left or swipe right from anywhere on the screen to get to app settings. 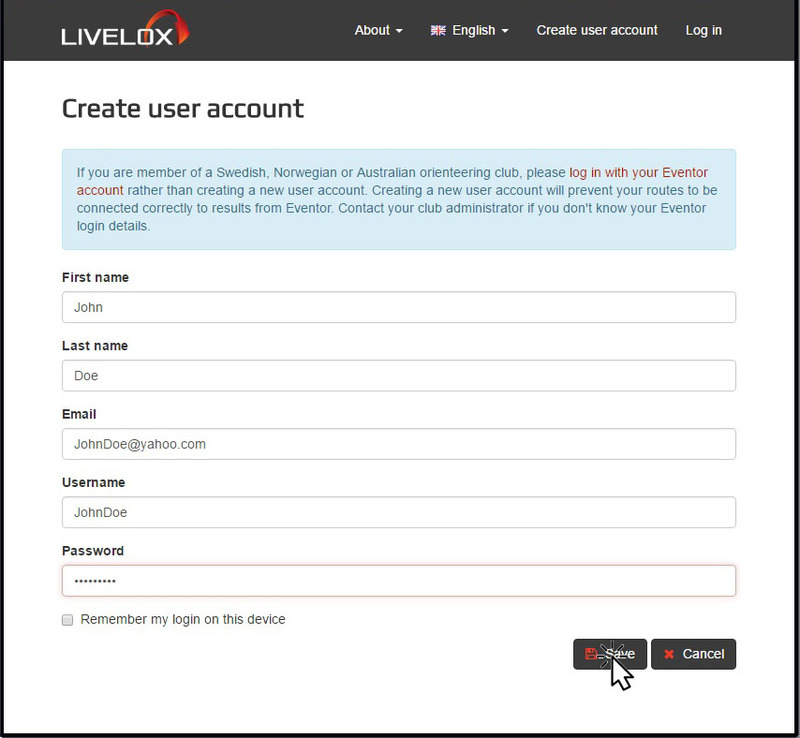 · Click “Log in”, set to “Log in with Livelox”, and enter the username and password credentials you chose for your Livelox account above. Click the “Log in” button. The Livelox main screen should now say it is recording as your username. · Just press the “Bullseye” button bottom center to start recording a track. The runtime clock and distance odometer will begin summarizing your movements while the GPS log records. 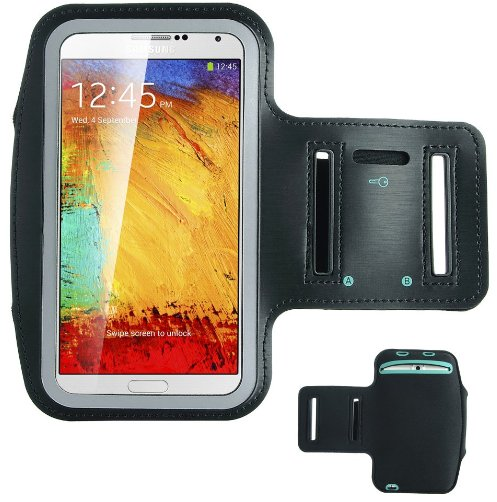 · Store the phone safely in a pocket, backpack, armband, or hat holder while you run. · Press “Stop” to end the track and save. 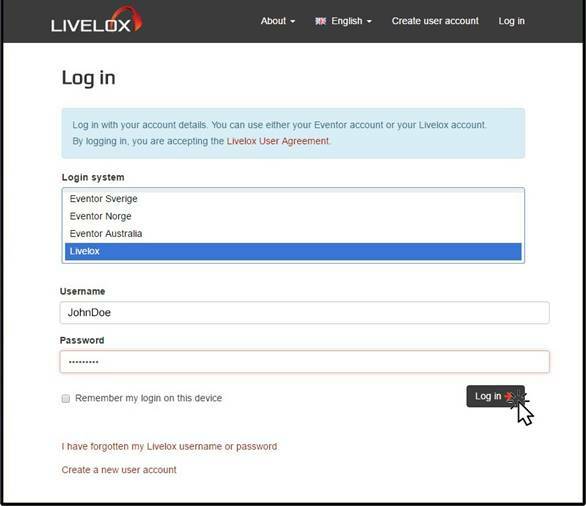 · You can then login to the Livelox web site and view or download your track to use in any way you choose. Note: Test the Livelox app before you really need it! Start it recording, walk around outside for a minute or two, stop the recording. Check the provided stats to see that they seem reasonable. If you’re interested, logon to the Livelox web site and look at your track overlaid on a Google aerial map. 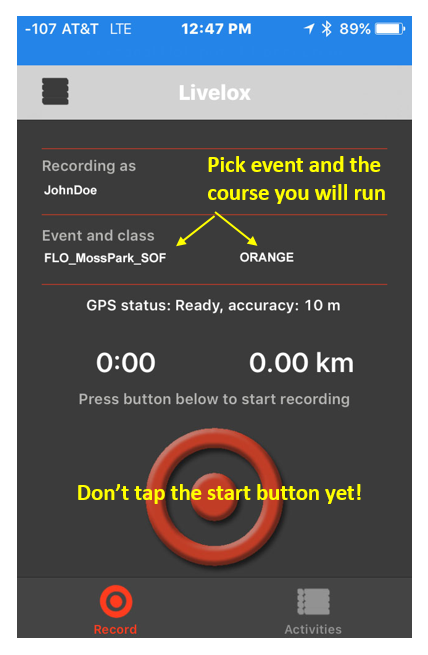 However, the easiest way to use Livelox in connection with an orienteering event is to connect to that event before you start recording. 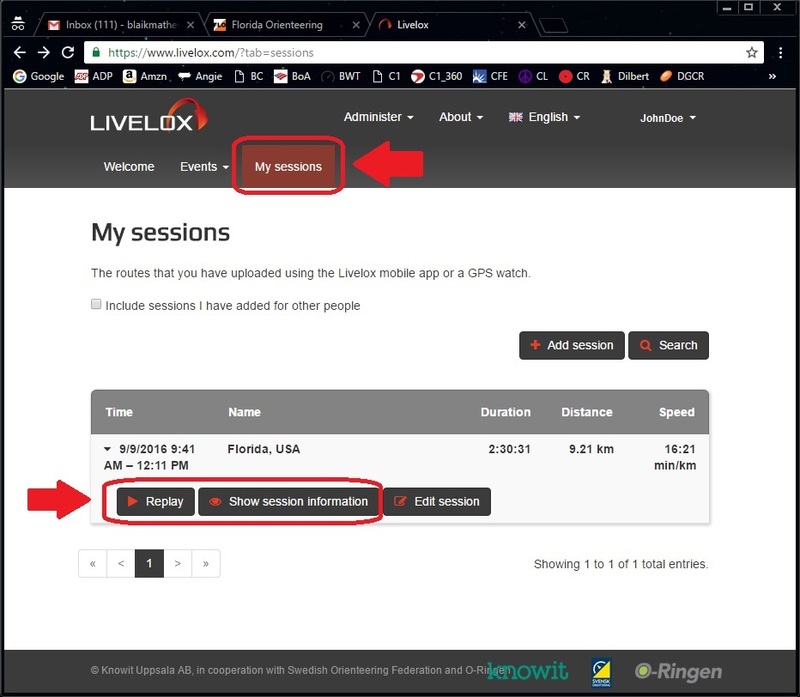 If you do this, Livelox will automatically upload your log to the correct repository for your event, course, and class, and overlay it on the map you were using. You can then compare your track to those of others on the same course! · Open Livelox, and login in as yourself. Check to make sure it lists your username under “Recording as” at the top. · Livelox will look up events in its database that are scheduled for today within a few km of your present location. That will typically zero in on the one event you’re participating in. Pick the appropriate event. o For a simple event in which results are broken down only by course run (called a “color” event), the classes will simply be the list of courses offered (e.g., WHITE, YELLOW, ORANGE, GREEN, RED, BLUE). Pick the course you plan to run. § So for example, if you were a civilian female running GREEN course, your class would be CFG. § Choose your class and click “OK”. 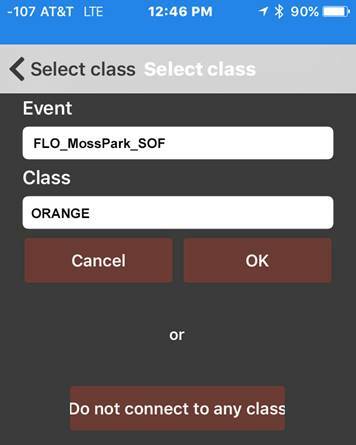 · Your Livelox screen should now say it is recording as you, at your chosen event, in your chosen class. You’re now ready to record your track, and when you end it, Livelox will know exactly where to put it, and what course map to overlay it on! · NOTE: Continuous use of the GPS chip can drain your phone’s battery at an accelerated rate. Start with a full charge, shut the screen off while running, and have a charger or backup battery at the ready when your course is done. There will be a multi-port rapid charger available at the SI download station at the finish table. 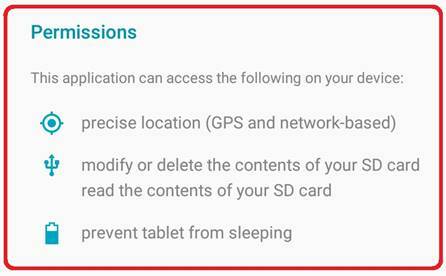 Make sure the app has access to the phone’s GPS service to pick up your location, and access to the file system to write the log file. 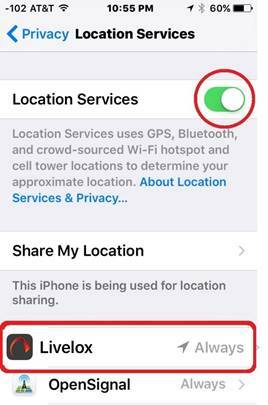 This should happen automatically, but it’s wise to double-check it, as different phones and user settings can impact how tightly controlled the location service is on your device. 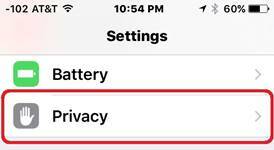 § Open the iPhone’s Settings app. § Set the Locations Services Switch to the ON position. § Scroll down on the same screen and tap the Livelox app. 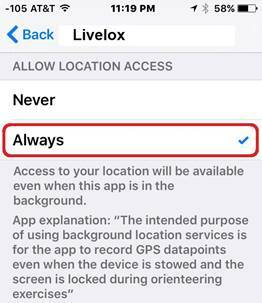 § Set “ALLOW LOCATION ACCESS” to “Always”. § Note: Different manufacturers have different implementations of the Android OS, so your screens may vary from the samples shown below. § Swipe down from the top of the home screen to display device settings. 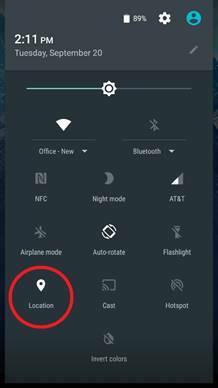 Make sure the “Location” setting is turned on (tap until green). 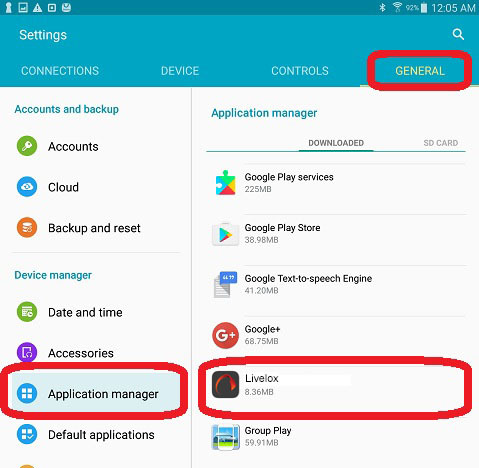 § In the Settings app, choose “General”, “Application Manager”, and tap the entry for Livelox. 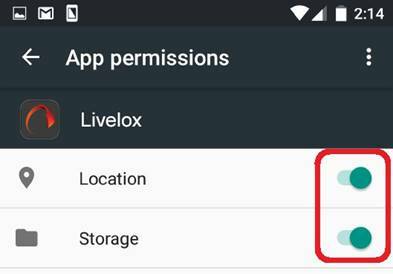 § Make sure that The options for access to “Location” and “Storage” are turned on. · Your body has a tendency to block GPS satellite signals. Although the Livelox app will work with your smartphone stuffed into a pocket or backpack, your GPS fix will be better if the phone is higher up and away from the core of your body. · One easy method of doing this is to carry the phone in an armband holder designed for running. These can be purchased for just a few dollars. Search for “smartphone armband” on Amazon or other retailer. · The best GPS lock is obtained by carrying your phone on top of your hat, where it has an unobstructed view of the entire sky all the time with no body shadow. Accomplishing this can be a challenge with a large phone, but it can be done simply, if unfashionably, by duct-taping a Ziploc baggie to the top of a hat. 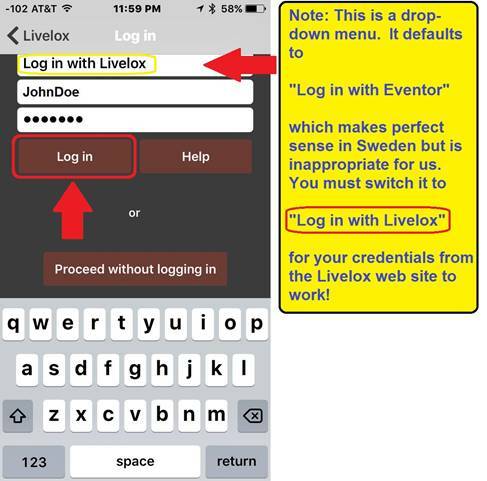 To view your track after the race, use any device with internet access to log into your account on the Livelox web site, www.livelox.com. Use your username & password credentials. Click the “My Sessions” tab at the top, choose your track, and click either the “Show Session Information” or “Replay” button. The “Replay” option will show you a movie of your run overlaid on the map. The playback can be customized with the setting pull-out on the right side of the screen. 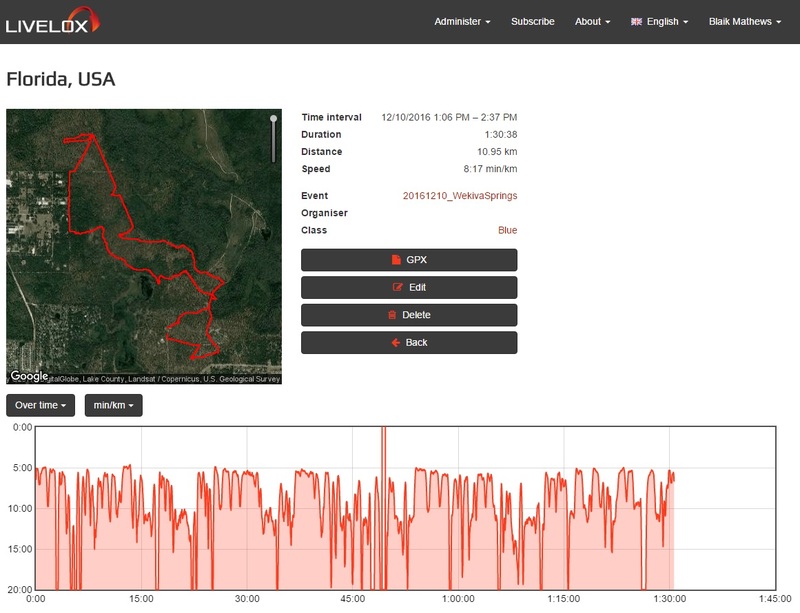 For detailed analysis of your run, use QuickRoute, which can give you detailed stats on your split times, speed and direction at each point on your route, and much more!